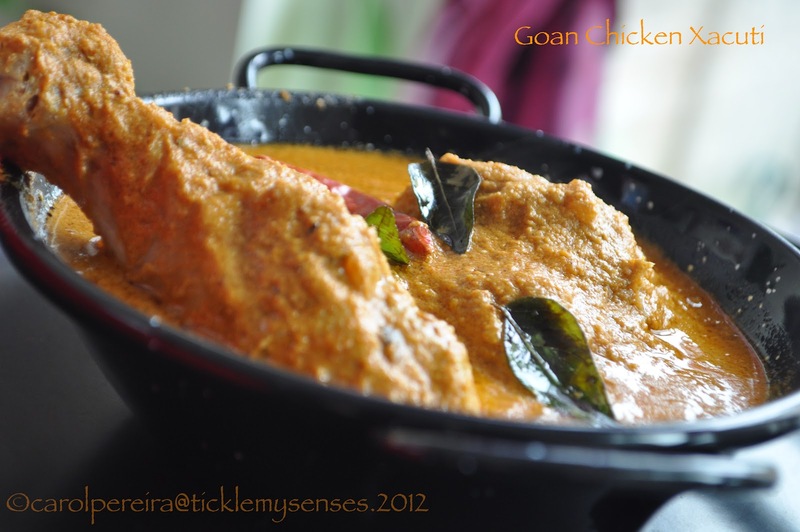 Tickle My Senses: Goan Chicken Xacuti without Coconut. Goan Chicken Xacuti (Chacouti or Shakuti) is a hot, spicy and flavourful curry that is traditionally made in Goa, using a blend of various spices and ground coconut. 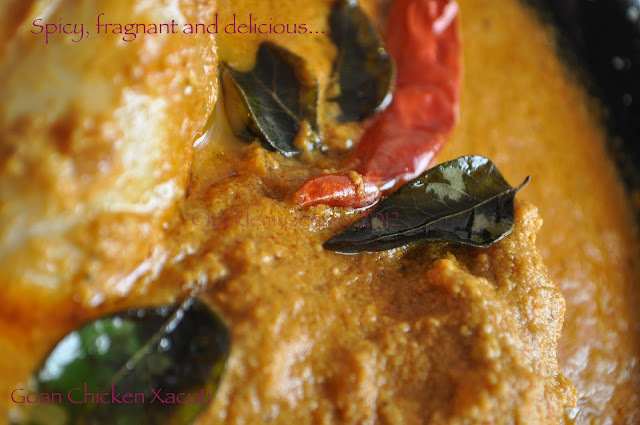 Goans love their Xacuti and you would find mutton, crabs, prawns or even vegetables lovingly cooked in this special blend. As for me, I was in a mood to be creative, so decided to use a good amount of "sunshine in a bottle" aka *sunflower seeds* instead of the usual grated coconut for the spice paste. These seeds are nutrient dense and packed with wonderful life enriching ingredients (see notes below for benefits). Certainly a good decision as the resulting curry is not only tasty, but low in fat, hot, flavourful and fragnant. It might actually transport you to one of the foodie shacks on the sunny beaches of Goa. So why not make it, then sit back and dip into it with the Goan pav/ bread, not forgetting your favourite tipple alongside, maybe a chilled pint or better still the Goan Feni :) Enjoy! Cheers!! 1. In a pan dry roast the sunflower seeds and cashew nuts together till slightly fragnant. Just before taking off add the poppy seeds and fry another thirty seconds. Put into a mixie. Add all the other masala ingredients and grind with enough water to form a fine paste. 2. In a large vessel take oil when hot add chopped onions and a little salt and fry till edges of onions brown. Then add the masala /spice paste and fry for 2-3 minutes, add the cut chicken and fry for another 2-3 minutes on a high flame till the surfaces appear white or sealed. 3. Add enough water to just cover the chicken, add salt, close vessel and cook till chicken is done. Make sure to turn/ stir in between to make sure masala/ spice paste is not sticking to base. Once chicken is cooked adjust the consisitency of gravy to your liking by adding in hot water. I left the gravy slightly thick. 4. Just before taking off the heat check for salt, squeeze over lemon juice/ tamarind extract to desired taste. 5. Seasoning (Optional step): This step will gives the curry the lovely flavour of coconut. 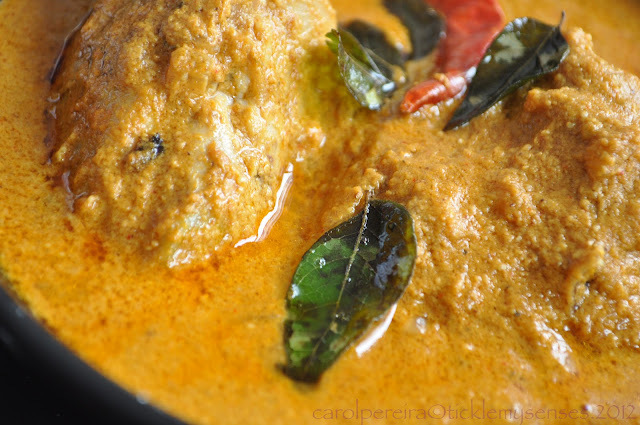 In 2-3 tsps of coconut oil fry a few curry leaves when crispy pour over curry. Mix well. 1. Sunflower seeds are rich in the B complex vitamins, which are essential for a healthy nervous system, and are a good source of phosphorus, magnesium, iron, calcium, potassium, protein and vitamin E.
They also contain trace minerals, zinc, manganese, copper, chromium and carotene as well as monounsaturated and polyunsaturated fatty acids - types of 'good' fat that may help to protect the arteries. 2. I have used Kashmiri red chillies in the spice paste to add heat to the curry. If using any other chilli powders please adjust quantities to suit your palate. wow! Your curry looks stunning Carol! I love the Xacuti and would love to try out your version without the coconut! goan chic xacuti without coconut and most of your non veg recipes looks super good.....keep rocking dear!! Thankyou PT, Balakrishna Saraswathy, Shireen ans GK Arusuvai. Thankyou for stopping by and apologies for the delay in replying. The best alternatives to sunflower seeds would be pumpkin seeds. Alternatively you could cashewnuts, which are slightly higher in fat content. I hope that helps. I hope you try the recipe and come back to let me know how you got on.